SVKM Maharashtra (Shri Vile parle Kelavani Mandal), Dhule Published Job Notification for 03 Maintenance Engineer Posts. 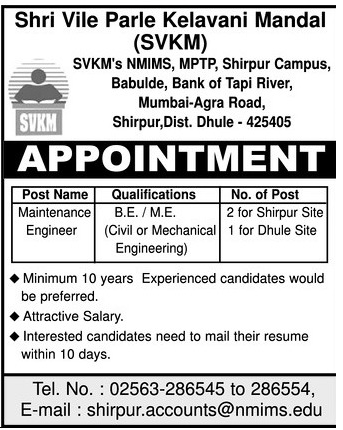 Candidates who wish to apply must look at SVKM Maharashtra Maintenance Engineer Recruitment 2018. Eligible candidates can apply Online before 30-06-2018. Education Qualification: BE/ME and More. For Post wise Education Details follow the detailed advertisement. Starting Date, Last Date to Apply Online at Shri Vile parle Kelavani Mandal which candidates should be remembers as follows. Start Date to Apply Online: 20-06-2018. Last Date to Apply Online: 30-06-2018. 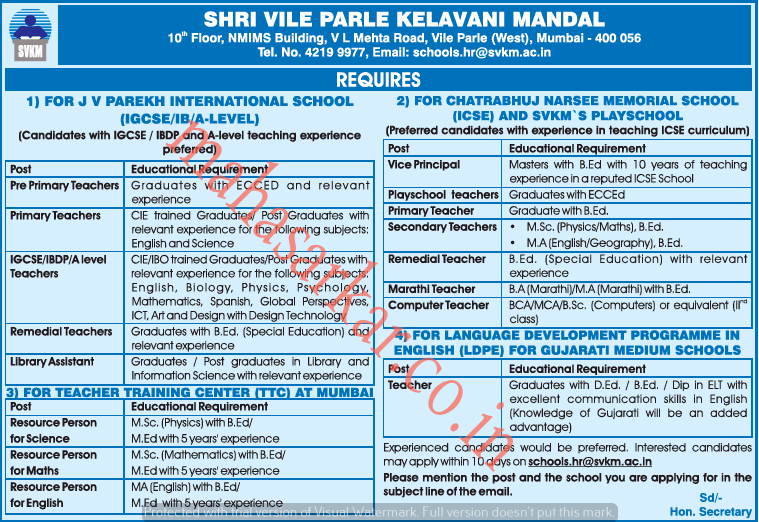 SVKM Maharashtra (Shi Vile Parle Kelavani Mandal),Mumbai Published Job Notification for Teachers – Resource Person & More Posts. Candidates who wish to apply must look at SVKM Maharashtra Teachers – Resource Person & More Recruitment 2018. Eligible candidates can apply Online before 14-04-2018. Education Qualification: M.Sc./M.ed/Graduate/Post Graduate/M.Sc/MA/Master Degree/BCA/MCA and More. For Post wise Education Details follow the detailed advertisement. Interested & Eligible candidates can send their application along with all the necessary documents and testimonials Email to schools.hr@svkm.ac.in. Starting Date, Last Date to Apply Online at Shi Vile Parle Kelavani Mandal which candidates should be remembers as follows. Start Date to Apply Online: 04-04-2018. Last Date to Apply Online: 14-04-2018. 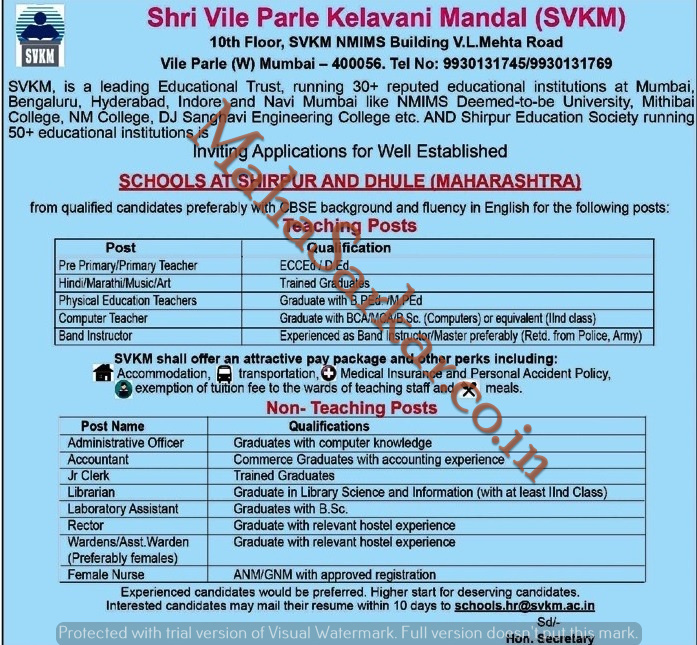 SVKM Maharashtra (Shi Vile Parle Kelavani Mandal), Published Job Notification for Teaching & Non-Teaching Post Posts. Candidates who wish to apply must look at SVKM Maharashtra Teaching & Non-Teaching Post Recruitment 2018. Eligible candidates can apply online before 27-01-2018. Education Qualification: ANM /GNM/Graduate/D.Ed/ECCED//M.Ped/B.Ped and More. For Post wise Education Details follow the detailed advertisement. Starting Date, Last Date to Apply online at Shi Vile Parle Kelavani Mandal which candidates should be remember as follows. Start Date to Apply online: 17-01-2018. Last Date to Apply online: 27-01-2018.